If you are in the process of organising your property removal, but want to save yourself the hassle and headache of having to deal with everything on your own, perhaps you should entrust your project to the best moving company in the TW9, TW10 area – Get Man and Van Richmond. With seven years of relevant industry experience and professionalism on every level we know how to handle your removal properly. Storage solutions available on long and short term basis. We maintain maintain a fleet of specially equipped transport vehicles of different size and load capacity, ranging from nimble city vans to speedy Transits and heavy duty Luton vans. This allows for flexible and efficient transportation on all jobs. The company is fully registered and licensed to operate throughout the UK. We also have comprehensive trade insurance. Removals are available for booking seven days a week, including public holidays. We cover both TW11 and TW12 postal areas. Call us and we will make moving easy and affordable. If you are moving your company’s offices in Richmond, we would be glad to provide you with a helping hand. Our licensed movers have much experience in the field of office removals in Richmond upon Thames, and they will offer you all their knowledge and skills, so that the job is done properly and on time. Request a free quote for your project now from our helpful customer support team over the phone or via email. We know that sometimes you need help with more specific moving jobs. That is why we would tailor a specialized removals Richmond covering service specifically for you. If you want to get antiquities, art or any other objects that require special care to be moved across the territory of the borough, we are definitely the right people for you. Get in touch with us now and let us tailor an individual plan for you project. No moving project can go without proper packing. That is why we have made sure to create a packing Richmond covering service that would definitely be up to your needs and high expectations. By using high quality materials and tested methods, we are going to make sure that your items are ready for transportation, and they will be safe while on the road – after all that is the purpose of the proper packing. While we do that, use the opportunity to get familiar with one of London’s best suburbs. Richmond, is a wealthy riverside district, full of pristine parks and green open spaces. Real estate in the area reflects Richmond’s high status. There are also many conservation areas of national importance around Richmond, TW10. The area has the largest commercial scene in the borough and offers heaps of shopping and entertainment. Don’t miss going for a walk along Richmond’s Riverside zone and definitely climb atop Richmond Hill for some breathtaking panoramic vistas of London. The London Borough of Richmond lies in the western parts of the city and is beyond any doubt one of London’s most famous areas. Richmond has an estimate population of 188.000 people and a density rate of 8.500 people per square mile. This makes Richmond one of London’s and England’s less densely populated areas. Most of the local inhabitants are from London’s middle and upper middle-class. 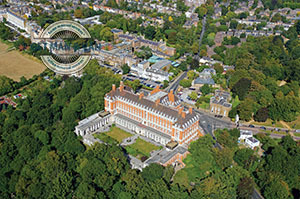 The borough is home to the Richmond Park Academy which is one of London’s finest secondary schools. The school was established in 1895 and gained academy status in 2010. At the moment the school has over 500 students from the ages of 11 to 16. Richmond upon Thames gets its name from the fact that the borough is located on both banks of the Thames in West London. It is a beautiful suburban part of the capital, and a very desirable place of residence, especially in the more affluent districts. Richmond upon Thames contains, among other things, the National Physical Laboratory, as well as the celebrated Kew Gardens, Hampton Court Palace and the Twickenham Stadium, all of which attract many tourists. Get Man and Van offers private and business clients in TW9 and TW10 areas access to the most versatile and inexpensive removal and delivery solutions available right now. We have professional experience in all types of property removals, including comprehensive commercial establishment relocations, and fixed schedule collection and delivery of household and office supplies. Our services can be adjusted as per individual customer needs without excess cost or unnecessary hassles. All work carried out by professional drivers and qualified mover technicians. Specialised packing, delivery of packing materials, boxes, crates etc. For extra customer convenience, the additional options listed above are also available as separate services. Customers in TW9 and TW10 areas are supplied with accurate quotes and flexible pricing, corresponding to the actual scale and complexity of the service. Price estimates can also be obtained by viewings and onsite quotations. Richmond is a major suburban hub of West London. The borough is well known for its many pristine parks and green open spaces, particularly the large Richmond Park. Many of these are designated as conservation areas. The Royal Borough of Richmond boasts a well-developed day and night time economy. Richmond is generally regarded as a wealthier part of the British capital. Richmond’s commercial centre is one of the 35 major retail and metropolitan hubs of Greater London. For many centuries, Richmond was one of the official royal residences.